It's nice to have some good news. I told you all recently that it looked like Master of Orion was coming to SteamOS & Linux, and now it has been confirmed by Wargaming themselves. Severian, Director of Product Vision Mac, Linux, and SteamOS = YES!! Now I am excited, I absolutely adore Master of Orion 2 (let's not talk about MoO3). No word on release yet, as it hasn't launched on any platform yet. I have to admit my favourite was MoO3. I loved how the game provided large scale policy tools that allowed you to rule scores of planets without micromanaging them. Unfortunately, the game had plenty of bugs, but I managed to spend hundreds of hours with it nonetheless. Too bad the UI feels hopelessly outdated today. It's a 4X strategy game, it's not some big explody shooter. Take a look as Master of Orion 2 and you will see. I was actually a bit worried for a while there. I really wish more developers would start using steam to communicate their plans for various OS releases, instead of simply ignoring or simply missing page after page of questions/requests. adolson That screenshot doesn't make it look very exciting. 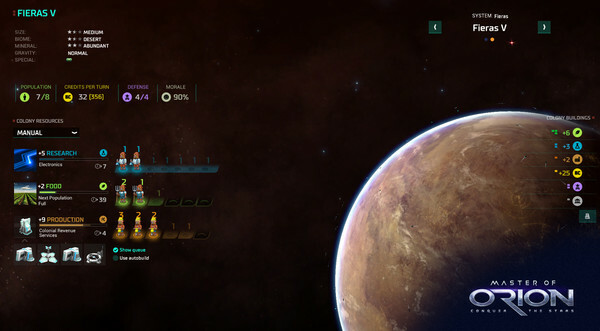 This looks exactly like Master of Orion should look like in 2016. I can't wait for the release. Glad to hear Linux is being supported. I'm going to be very cautious about this title, though, after the bitter pill that was MoO3. It's hard to make a turn-based 4x strategy game look "exciting" in a screenshot. Look at the screenshots for Civilization V. It looks pretty dull, but it's one of the greatest games ever made. Talk about a blast from the past ...I'm eager to play that kind of game which I haven't played in a very, very long time.